Jerusalem, Israel --- April 30, 2015 ... Upon receiving the first reports of the devastating earthquake that hit Nepal on Saturday, 25 April 2015, Israel immediately initiated the supply of emergency humanitarian aid, flights to bring rescue and medical teams to the area, and the establishment of a field hospital. The first Israel rescue plane, from the IDF Home Front Command, landed in Kathmandu on Sunday (26 April). On the same day, Magen David Adom (Israel's Red Cross National Society) sent a plane to Nepal with a delegation of doctors, nurses and paramedics. A 260 member mission from the IDF Home Front Command was sent to Nepal on Monday (27 April). The mission rapidly established and opened an advanced multi-department hospital in Kathmandu, equipped with approximately 95 tons of humanitarian and medical supplies from Israel and a medical staff of 122 doctors, nurses and paramedics, to provide care for disaster casualties. The facility and includes pediatric, surgical, internal medicine, neonatal, and radiology departments as well as a maternity ward and emergency and operating rooms. The hospital has the equipment, capacity and manpower to treat approximately 200 patients each day. The aid mission also comprises highly skilled search and rescue teams from the IDF National Search and Rescue Unit, who commenced operation in Kathmandu on Tuesday (28 April). The Israeli humanitarian aid mission arrived in three Air Force planes (two cargo and one passenger) and two El Al planes (one cargo and one passenger) loaded with emergency aid. In addition to the emergency assistance, Israel is committed to actively contribute to Nepal's long term reconstruction and rehabilitation. The activity will be led by Israel’s Agency for International Development Cooperation (MASHAV) and include civil society organizations which are active in this field. The details will be determined together with the Government of Nepal, in accordance with the long term needs arising in the aftermath of the devastating earthquake. For many years, Israel's vast and respected expertise in responding rapidly and effectively to mass casualty emergencies has been used in the international arena, to assist countries in the immediate aftermath of both natural and man-made disasters. In the recent past, Israeli emergency aid missions have provided vital assistance to the Philippines, Japan, Haiti and other disaster-stricken countries. Israel – repeating the miracle of Haiti in Nepal. Jerusalem, Israel — April 26, 2015 — Israel Prime Minister Benjamin Netanyahu, today spoke to the commander of the Israeli delegation to Nepal, Col. Yoram Laredo. The Prime Minister was informed that the rescue mission to Nepal includes an IDF field hospital and that its goals were locating Israelis, rescuing people who were trapped and treating the injured. IDF Col. Laredo told Prime Minister Netanyahu that an advance team had already landed and was preparing the infrastructure for the arrival of the humanitarian mission. “You are being sent on an important mission. This is the true face of Israel – a country that offers aid over any distance at such moments. Good luck. We are counting on you,” said Netanyahu. A 260-person Israel Defense Forces mission carrying 95 tons of supplies and 40 doctors has departed for Nepal on this Sunday night. The IDF will remain there for at least two weeks. When it arrives on Monday, half the Israeli team will set up a field hospital — including operating rooms, X-ray equipment and pediatric care — to provide emergency medical services to the wounded. The other half will conduct search-and-rescue missions in collapsed buildings. 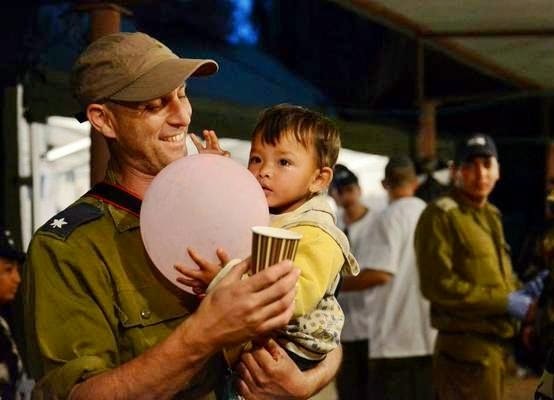 IDF Spokesman Lt. Col. Peter Lerner expects Israel’s field hospital to be the first in operation in Nepal. 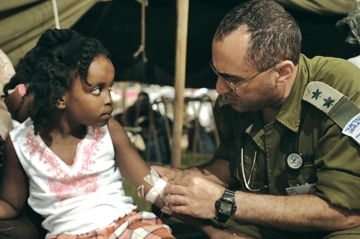 In the past, the IDF has set up field hospitals following natural disasters in Haiti, the Philippines and Japan. Israel President Reuven Rivlin spoke this evening with senior IDF Home Front Command officer Brig.-Gen. Yoel Strick, as he prepared to send a team of 260 search and rescue, and medical professionals from Israel to the disaster area in Katmandu, Nepal. The Brig.-Gen. thanked the President for his kind words, and said he would pass them on to the members of the delegation. A day after an earthquake killed more than 2,400 people and injured about 6,000, residents grew frantic and the government was entirely overwhelmed as aftershocks sent the people of Katmandu screaming into the streets. A global support page for Israel’s Nepal humanitarian efforts has been established at Israel4Nepal.com. Help Israel Save Lives - Donate Here! This Israel Remembrance Day video was taken on the streets of Ra'anana, Israel. and Ashkelon to Jerusalem, Tel Aviv and Haifa. and resolve for a secure and peaceful future. Converting Jews To Christians In Ra'anana, Israel? Ra'anana, Israel --- April 18, 2015 ... No, the Jews are not running to Pontius Pilate and the Romans have no crucifixions scheduled for this weekend. But someone forgot to fax the Jehovah's Witnesses that Jews do not live in Israel to become converts to Christianity. Ra'anana residents, municipal officials, a city Chief Rabbi and the Yad L'Achim anti-assimilation organization coordinated efforts to cancel a Jehovah's Witnesses baptism ceremony today. This is the second time that Yad L'Achim has succeeded in heading off the same baptism-of-Jews ceremony. It was first scheduled to be held in the city of Holon, just south of Tel Aviv two months ago. The activist organization received word of the planned event, which was to be held in the city's Yad LeBanim building erected in memory of fallen IDF soldiers. City officials were contacted, and the baptism was called off. Finally, on Wednesday, the city council members of the United Religious List of Raanana drafted a clear ultimatum to Ra'anana Mayor Ze'ev Bielski: "If the ceremony is held, we quit the city government coalition." Jehovah's Witnesses actions were also particularly offensive given that the Jewish nation had just finished observing International Holocaust Memorial Day. Relations betweens Jews and Christians have never been warmer. We are the Infidels of a global conquest waged by Islamic Jihad. But please, let us respect one another's religion without trying to convert one another. Israel may practice freedom of religion, but please respect the ancient and sacred Jewish values for which we Jews embrace. Israel allows individuals to practice their own religion but there are laws that specifically prohibit proselytizing. And after all, we don't go around telling you not to eat pork or attempting to behead you. Go to Syria, Sudan, Iran, Qatar, Saudi Arabia or Iraq - not Israel. Jerusalem, Israel — April 15, 2015 … Israel President Reuven Rivlin this evening at Yad Vashem, addressed the official ceremony marking the commencement of Holocaust Martyrs’ and Heroes’ Remembrance Day. “We stand here tonight, in painful silence at Yad Vashem, in Jerusalem, the capital of Israel, on the eve of Holocaust Memorial Day,” said Rivlin. “Exactly seventy years since April 15th 1945, a Sunday afternoon. The day when the first British soldiers crossed the gates of the Bergen-Belsen concentration camp. The joy of liberation was replaced by horror. The horror that was revealed before their eyes was inconceivable. Not just today, but every day, we walk the depths of the valley, extruded between two mountains. This mountain of memorial and remembrance, on one side and the mountain of revival and vision on the other. The mountain of memory, commands us, the Jewish people, to remember. Remember the sounds. Remember the sights. Remember the names. And yet the mountain of vision and rebirth, of construction and creation, calls on us to look ahead, and step into the future. Continuing to build a magnificent country, continuing to strive to construct another world, a safe world, full of promise – for us and for future generations. My brothers and sisters, Holocaust survivors, heroes of revival. During this uneasy journey, you have been our ‘Pillar of Fire’ before the camp. You – who found the strength to shake off the ashes of the crematoria, and the soil drenched with tears and blood – have instructed us to select the path of life, and realize a vision. You, who have loved and laughed, who have planted an orchard, have built a national home, as well as private homes. You have guided the entire nation. Today, seventy years after the liberation of the death camps, we stand before you and we swear an oath, and promise, ‘All of us, each and every one of us, have a number tattooed on their arm’. Yet, at the same time and in the same breath we remember: we came from Auschwitz, not because of Auschwitz. We cannot let the pogroms, the bellowing smoke of the crematoria blind us or blur our abilities to recognize our past, our identity, our heritage – which are stronger than those who with destroy us. 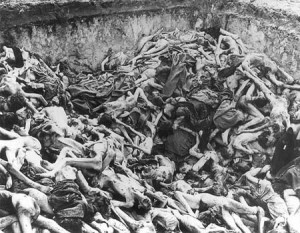 The Holocaust is our lowest point, the most dreadful, in Jewish history. The moment of horror for all humanity, but the Jewish journey does not begin with it, just as it does not end with it. The Jewish journey begins in the Land of Israel, and it is here that it always strives to return. There are those who mistakenly think that the State of Israel is some form of compensation for the Holocaust. There is no greater mistake. The State of Israel is not a compensation for the Holocaust. The State of Israel was established, in its own right, out of a love and longing for an ancient homeland, by virtue of a dream that came true, a dream that became a reality. Not out of the fear of extinction or out of hatred of the other. Four months ago, I stood in Poland, whose earth is soaked in blood, and I said that the State of Israel will forever deplore Auschwitz, and everything it symbolizes: anti-Semitism in all its forms and manifestations; The desecration of human dignity, whoever and wherever it is found, the desecration of that which was created in the image of God. The State of Israel, will continue its struggle against these and will not surrender. We build our future here, with open and alert eyes. We will not belittle any threats. Nor belittle, shameful statements calling for the extinction of the Jewish people. Yet, while we are prepared, we are not scared. The horrors of the past and the threats of the present, will not dictate our lives, nor shape the lives of our children. They will not dim our hopes for a future of creation and prosperity. My brothers and sisters, Holocaust survivors. We will continue to walk in the spirit in which you led us for seventy years. We will continue to impart the memory of the Holocaust, from generation to generation, as it is tattooed into our flesh, but will not determine our future. Joel Leyden = Top 1% Most-Viewed Profile | DigitalPrConsultant.com + OnlineReputationPr.com + BrandingProfessional.com. Joel Leyden was one of the first professional international Public Relations, Integrated Marketing, Social Networking, Online Reputation, Marketing, Business Development, Advertising, Digital, Internet Marketing, Social Media Strategist, SEO, E-Commerce, Cross-Cultural and Crisis Communications consultants who came from Madison Avenue. Leyden Communications Inc. was established in New York City, with offices at the World Trade Center. Leyden Digital is responsible for providing a variety of international PR, marketing, media, branding and business development services, projects for some of the world's largest commercial, governmental, political and non-profit organizations. Joel Leyden, who holds B.A. Degrees in Journalism and Psychology and a Masters Degree in Mass Communications, has received Awards in Crisis Communications Management, International Marketing, Advertising and E-commerce. Joel Leyden is an Internet pioneer @ creative development. First to co-create Israel's first commercial Website. Today, Mr. Leyden serves as an international media consultant for Israel's Ministry of Foreign Affairs, Ministry of Trade and Industry, the Israel Defense Forces and has consulted US State Dept. Joel Leyden's professional marketing performance and success has been documented by dozens of leading governmental, non-profit and commercial organizations. Joel Leyden has served @ IDF Combat Engineers, MAGAV Anti-Terrorism Unit and as an officer in the IDF Spokesperson's Department. Joel Leyden is the proud father of 3 children and is involved in non-profit work for disaster relief and the homeless. Specialties:International public relations, PR, online reputation management, integrated marketing, social media, public affairs, SEO, crisis communications management, journalism, branding, Internet marketing, advertising, Web site creation, trade shows / event marketing, direct mail marketing, creative copywriting, media coaching, cross-cultural consultation, fashion, culture, retail, B2B, B2C.